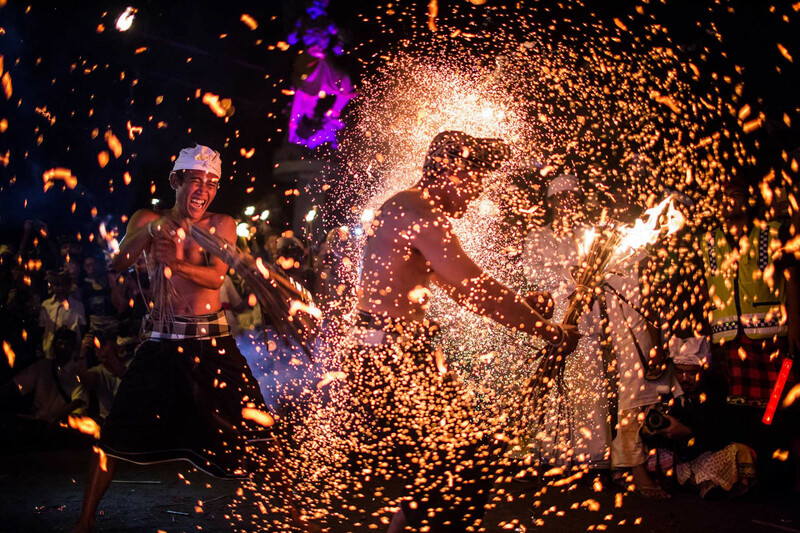 Bali is attractive and noisy during sandhyakala (dusk) when day meets night on Pengerepukan – the eve of Nyepi (Day of Silence). 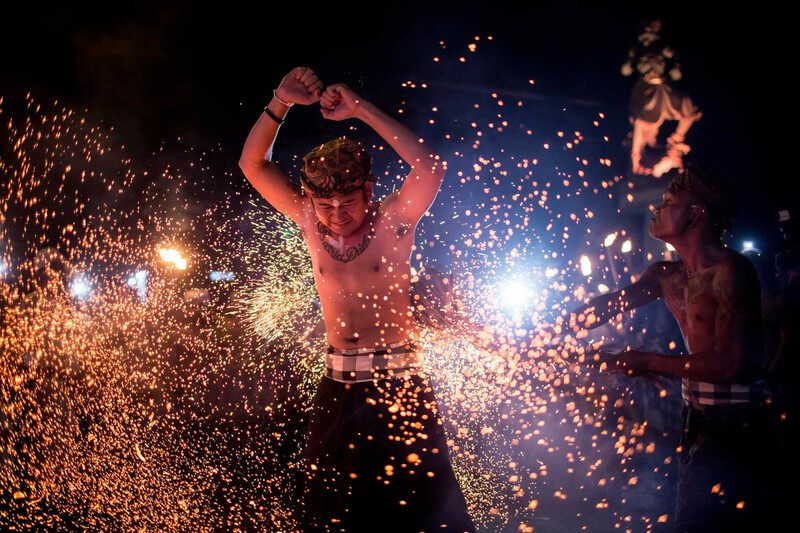 Everyone carries torches and creates noise by banging their pans and sprinkling rice. 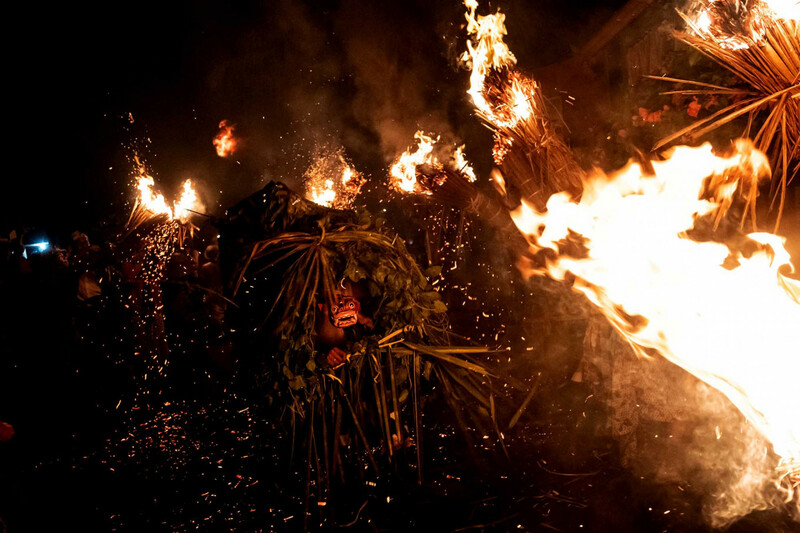 Along major thoroughfares on the resort island, ogoh-ogoh (giant effigies) are paraded, before the people burn them as a symbol to neutralize negative energy. 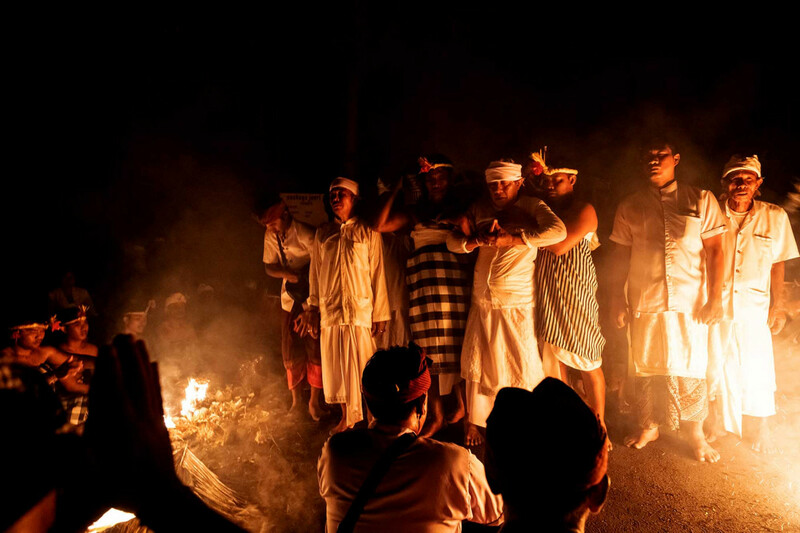 However, the Nyepi celebration this year was different from previous ones in Jasri village, around 60 kilometers from Denpasar. 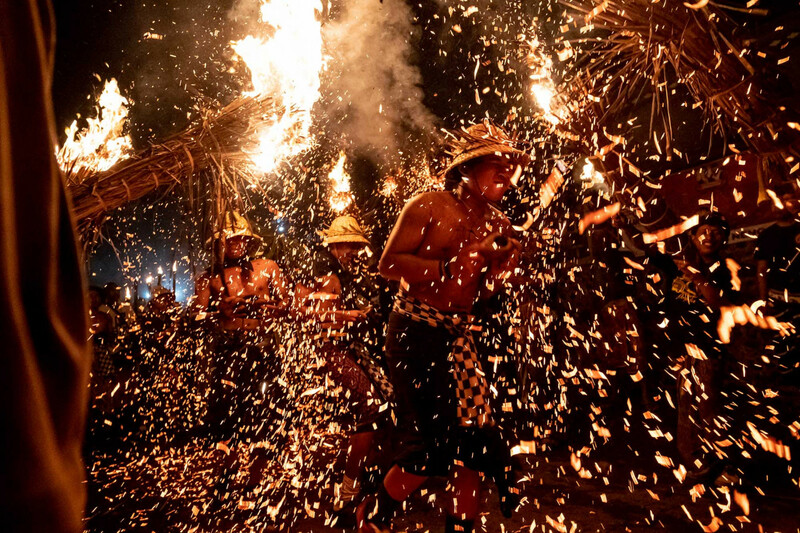 The villagers celebrated the Ngusaba Muu-muu with Terteran (battle of fire) ritual as its peak. This tradition is carried out every two years, on odd years. Pecalang (local security officers) were on alert from 3:30 p.m. to help direct traffic and clear the roads. When dusk came, all lights went off. The road and houses were in total darkness. 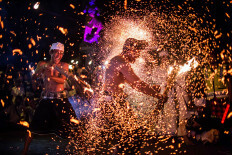 Balinese people are not allowed to light matches or turn on mobile phones. 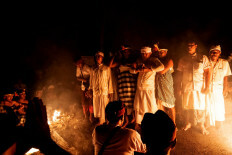 At 8 p.m., the pengerembat (ritual servant) walked along Jasri beach. Wearing chequered fabrics, they carried holy fire called sundih, which was made of dry coconut leaves. A jro mangku dalem (priest) walked in the middle. 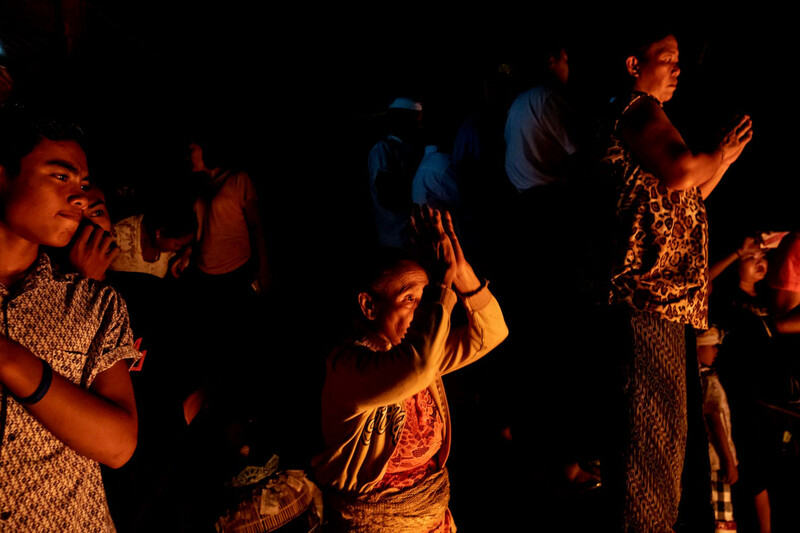 Along the road, villagers folded their hands in front of their foreheads in salute. Thousands of villagers were waiting for the priest and shouted “Ida Bharata” (the gods). 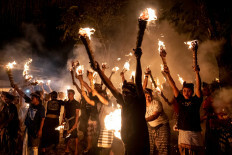 Hundreds of torches were thrown away in the direction of the priest and his guards. They walked slowly to the great hall. 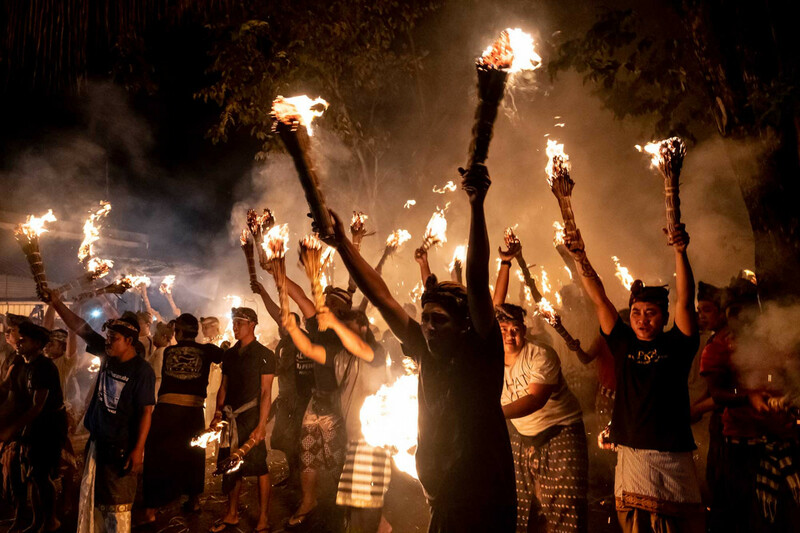 “Terteran is the ritual to purify a village from the Bhuta Kala [literally meaning eternal energy and time but often symbolized as a demon] which has negative energy through the fire. We do this every two years,” said Putra Ayusta, Jasri village representative. According to an old myth, Jasri was hit by a plague many centuries ago and villagers believed that it had been brought by Bhuta Kala. This demon had to be neutralized using fire, said Putra. 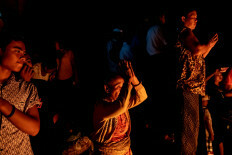 Villagers in Punduk Dawa village in Klungkung regency conducted the Mabuwu-buwu ritual to welcome Nyepi. They also used the same symbol of fire to purify their village. A Barong – a mythical character in the shape of a lion – was made from coconut leaves and was paraded along the village. 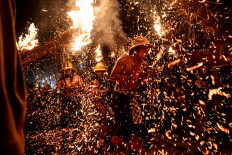 A similar ritual was also conducted by people in the Satria Kawan temple in Klungkung, the Lukat Gni ritual, characterized by a battle of fire using dry coconut leaves and during which they smashed each other’s bodies with the burned leaves. 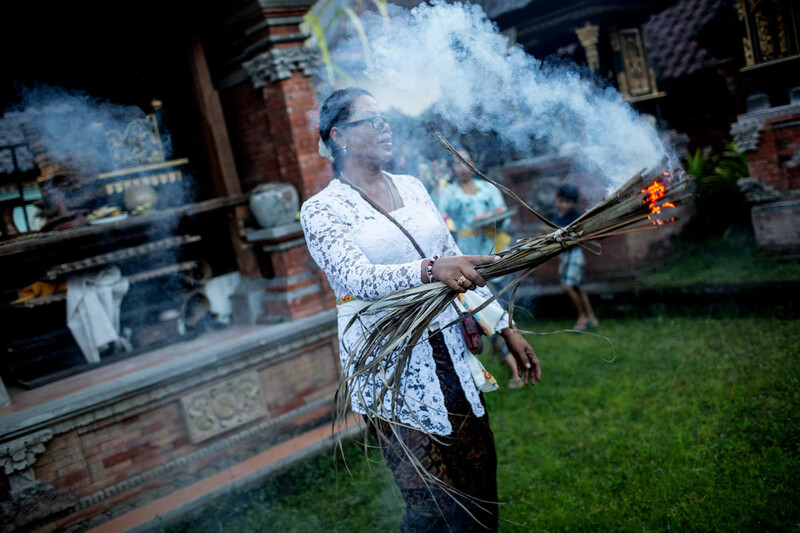 Nyepi is the beginning of a new year for Hindus according to the Saka lunar calendar. Balinese people will shut down their activities for 24 hours. All markets, shops, offices, cafes, bars, restaurants and other public places are closed down. No entertainment including televisions, radios and internet are allowed.